I need to get to L.A. if I'm ever going to catch my big break. Guess what I did this morning!? I actually got up early, out of my warm heavenly bed, and got a run in on the treadmill! I have been terrible about getting morning workouts in lately, but I figured this morning was the only time for me to do it because we have a laundry list of things to do tonight to get ready for our trip! Plus my friend who is extremely dedicated to morning workouts texted me an encouraging message this morning to help get me out of bed. She is amazing. 🙂 Thanks a million! More good news, I didn’t have any knee discomfort today. Whatever was causing the discomfort the other day has completely subsided which I am very thankful for. I really loaded up my bowl for yesterday morning’s breakfast. Besides the usual fruit, yogurt, and cereal, I also added in a small handful of chopped walnuts and extra yogurt for more “staying” power. This baby held me over until lunch. Since it was Ash Wednesday, we were supposed to fast in between meals. I found that this is extremely difficult for me because I am a “small meals throughout the day” kind of person versus a three meals that’s it person. I always have breakfast, sometimes a snack around 10 but usually not, lunch always, piece of fruit or small snack mid-afternoon, dinner, and then a snack before bed. Yesterday I stuck with just breakfast, lunch, and dinner, and my body was upset with me almost the entire day. Oh well, it was just one day! After work I met Dana for Ash Wednesday mass. Day one of no sweets was a good one. My body is seriously unhappy with me after all the sweets I have eaten lately. It is thanking me for a break. I feel out of balance and it’s time to get back in balance. I went for a walk on the treadmill when I got home. I have been a little lazy when it comes to actually making the trip to the gym, which is only 7 minutes away BTW. I honestly feel that the laziness is associated with the sugary diet lately. It is amazing how quickly you can begin to feel a slide. Dinner was veggie-filled. 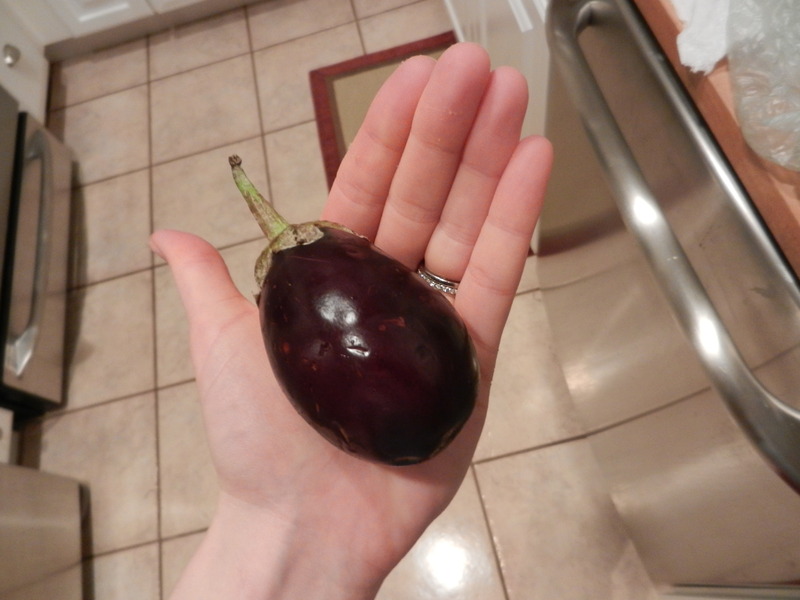 I sautéed up a bunch of veggies from the fridge including this little cute eggplant that I had bought at Whole Foods last weekend. It’s just a little babe! 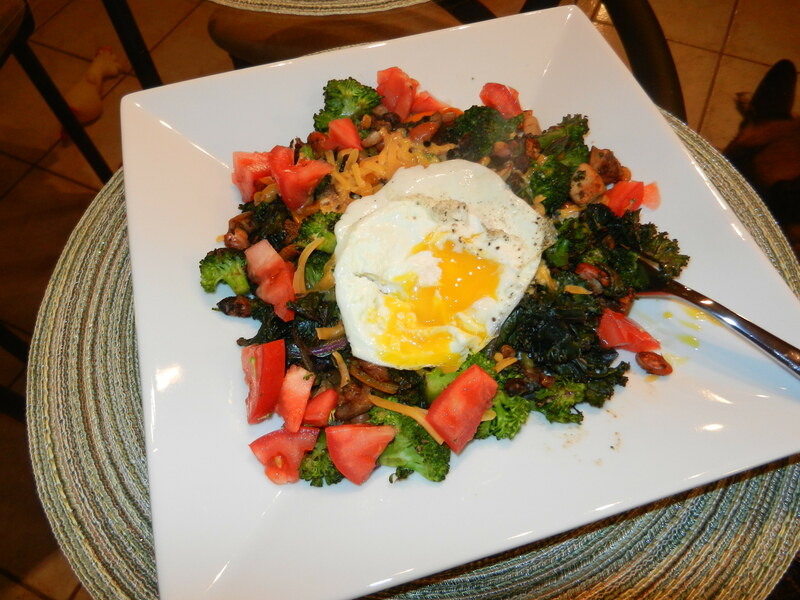 I also threw in leftover fajita filling from last night’s dinner, broccoli, mushrooms, kale,with a little garlic powder, salt and pepper, and topped the warm dish with diced tomato, shredded cheese, and of course, a runny egg. I love my runny eggs. Delicious and satisfying as always. The rest of the night was dedicated to one last load of laundry, and relaxing while watching Modern Family and Whitney! Wednesday night is our “big” night of shows! No packing was done last night which means tonight will be a fun-filled packing extravaganza. I really don’t like packing. I always pack WAY too much because I never know what I will need! I am off to work! Have a Happy Thursday! 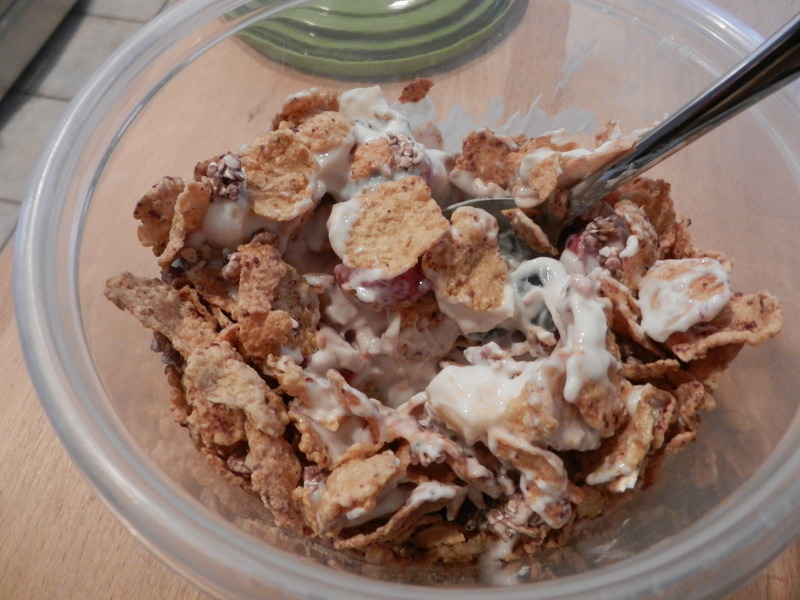 This entry was posted in Breakfast, Dinners, Family, Moose and tagged Moose, Veggies, Yogurt by Melanie. Bookmark the permalink. I tried a wrap that made me think of you… I basically just threw whatever I had in my fridge into a wrap and called it a day, and it was delish! So delish. I love laughing cow wedges! The babybel laughing cow cheeses (hard round ones) are an AWESOME addition to eggs too – they melt into ooey-gooey-goodness like no one’s business! That DOES sound right up my alley! Num!